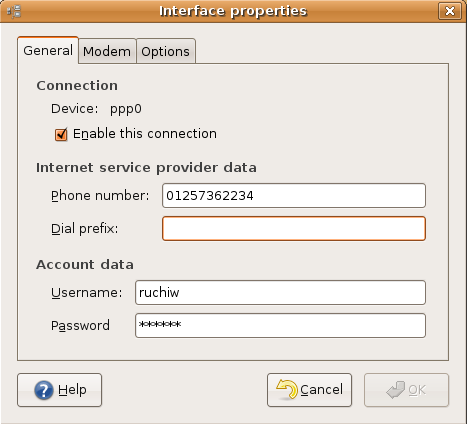 Dial-up access is a form of Internet access through which the client uses a modem connected to a computer and a telephone line to dial into an Internet service provider's (ISP) node to establish a modem-to-modem link, which is then routed to the Internet. 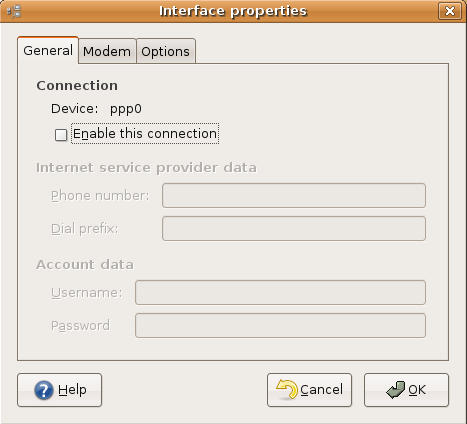 Most ISPs provide dial-up connections supporting PPP because it is a fast and efficient protocol for using TCP/IP over serial lines. PPP is designed for two-way networking; TCP/IP provides the transport protocol for data. PPP (Point to Point Protocol) uses several components on your system. The first is a daemon called pppd, which controls the use of PPP. The second is a driver called the high-level data link control (HDLC), which controls the flow of information between two machines. 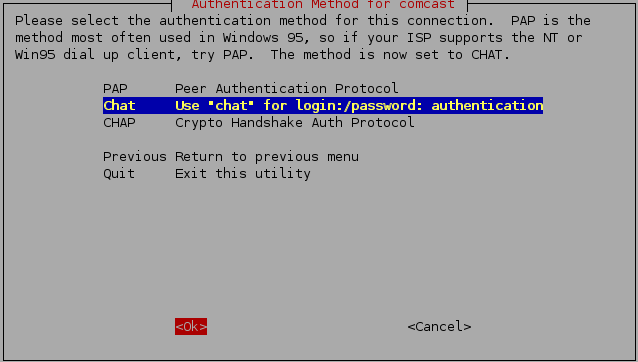 A third component of PPP is a routine called chat that dials the other end of the connection for you when you want it to. 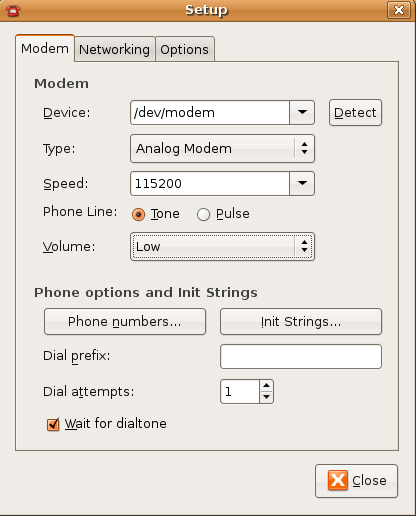 Next, click on the modem tab to specify details about your modem and also configure the speaker volume. Most telephone systems use tone dialling nowadays, so make sure this is selected . I have selected the speaker volume on medium. 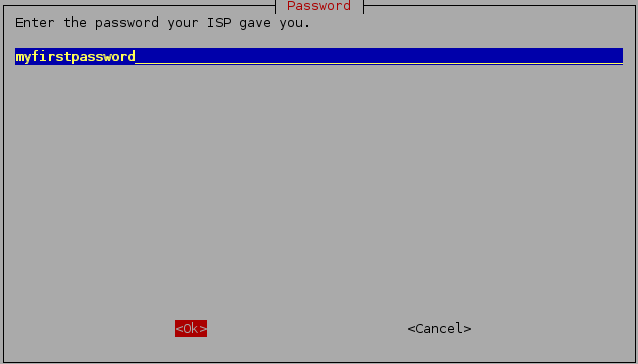 Now you need to click on options tab If you are using a laptop, then you will probably want to uncheck Set modem as default route to the Internet whilst you are on a LAN, otherwise you may struggle to see anything! Tick it when you are expecting to use your dial-up connection though, and Ubuntu will use this connection to get out onto the Internet.You need to select other two options checked. 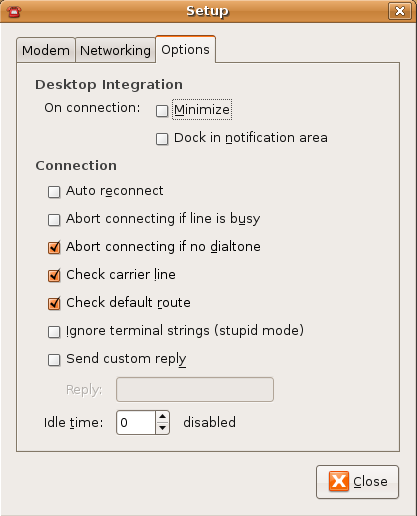 Now You can use the Gnome Modem Monitor and Network Monitor panel if you want to stop, start and monitor modem connections. 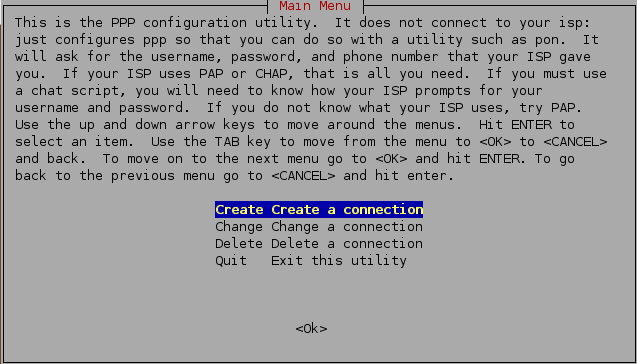 configure a connection using pppconfig, a command line utility to help you to configure specific dial-up connection settings.This is a command line based option to manage dialup connections. 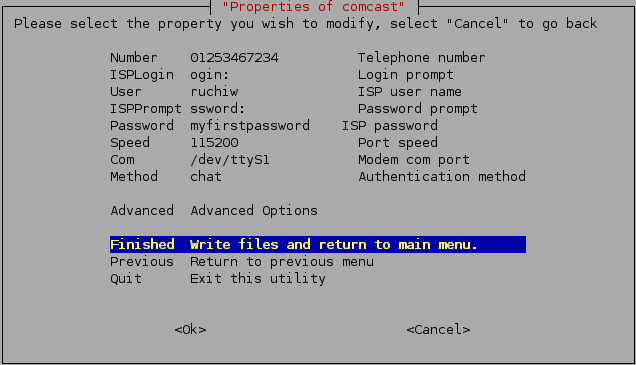 Select "Quit Exit this utility"
# connect to the ISP configured as "comcast"
# disconnect the ISP configured as "comcast"
GNOME PPP is an easy to use graphical dialup connection configuring and dialing tool with system tray icon support.It uses GNOME/GTK+ for its graphical interface and integrates well in GNOME desktop environment, but it can be used in other environments. 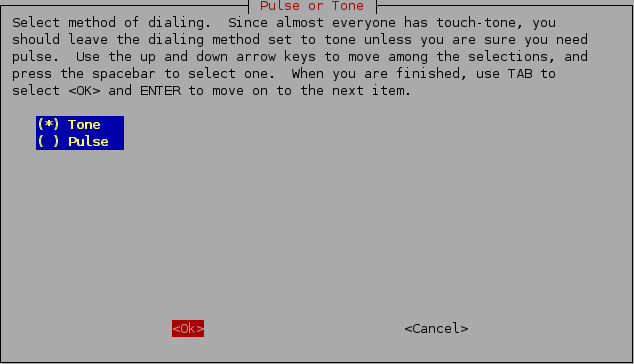 It also uses WvDial dialer as its backend, providing simple configuration via config files. You can also use plain wvdial if you don't have X running. 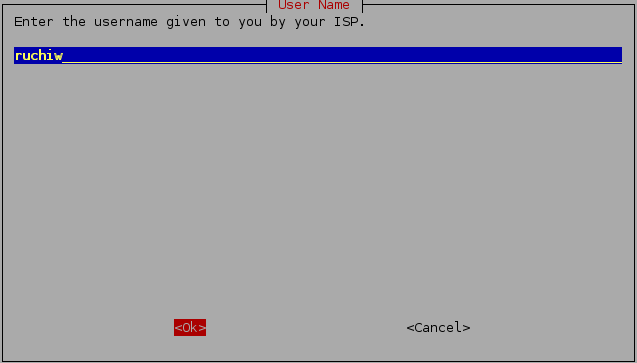 You can not establish a dial up connection using Network Configuration(found in Preferences)or located on the upper panel(Mini computer icon). Use this page. Go back to the top and look at the instructions and graphics for Wvdial. You will need to learn how to use Terminal and Command Line to get your 8.10 online. Once you get the computer online. 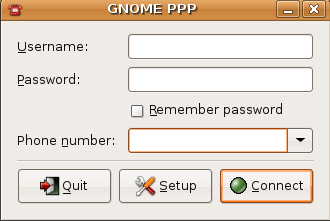 You can install GnomePPP and dial in with a single click. If you don’t understand. Reply and I will try to simplify the directions. I am writing to your from an 8.10 setup on dial up. So it can definitely be done. Good Luck. Only prob is, I dont know what number it needs to dial, what username and what password. And I think to ask my mobile provider, they would want me to pay before they divulge that info. Is there any way I can extract this info from my mobile itself? Thanks dude, now I’m gonna probe the net a little with these ideas thanks to you! If I understand your question correctly; you are asking how to connect to a dial up account with a mobile(celluar) account. 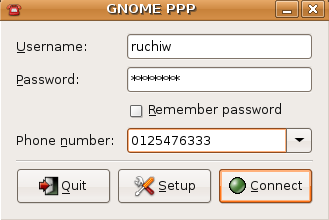 In the past it was possible to use KPPP which is the KDE version of GnomePPP to accomplish that very action. But even then it was necessary to have a valid dial up account which you don’t possess and there is no way to extract such information with your mobile connection. Your mobile company would not charge you for information that they can not provide because it is an unanswerable question. I suggest that you search the Net for Free Dial Up ISPs as there are still a few around, open an account then attempt to use GnomePPP or KPPP to connect with your mobile card. It seemed to be a somewhat complicated series of steps to follow. Take a look at the links below to help you test that theory. The easiest thing would be to buy a mobile broadband card such as Virgin Mobile Broadband and a $20.00 top off card. You could then access the Net whenever you want at a reasonable rate and time frame. Think of it as Trac Fone for Laptops. Just get your mobile and its data cable which will allow you to connect your mobile to your laptop’s usb port. Go to your Network Manager on the Top Panel and click to see available connections, and you will find a new entry there saying “New GSM Network” (or something similar, what it says there will differ slightly on Karmic and Lucid). and that is it! Job Done! Click on it, and you’ll see it establishing the connection, then connect…now open up Firefox and surf! Note: Searching on the net I found the only way to do this in Winblows is to use Nokia’s PC-Suite software, which I tried as well…and the Nokia PC-Suite software communicated with my mobile, then my mobile displayed on its screen “Contact your provider to subscribe to data packet exchange…” or-something-er-other. I have read that mobile providers want you to pay for that additional service of using their internet on other devices. They call it tethering. Thanks Canada Lee! Congratulations on your success and for sharing the solution. I will familiarize myself with your instructions. URGENT: There has been an effort to conceal dangerous command line commands in various Ubuntu Help Forums. These instructions can erase your hard drive and destroy data to attached devices such flash drives. 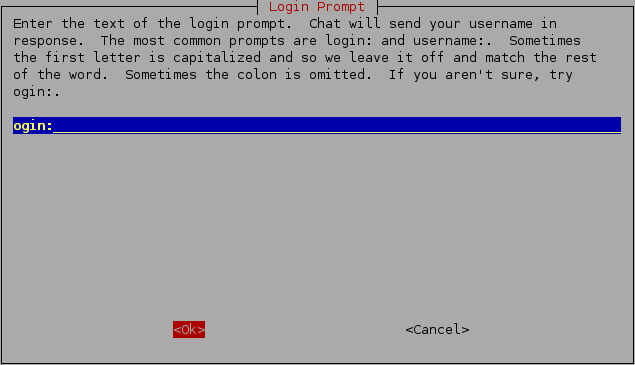 Use extreme caution when running commands in Terminal/Console on advice from help forums. You may read an Official Alert with more detailed info from the link below. Now connect your mobile to your computer via the data cable. Note: when doing so, some mobiles will detect connection to a computer and will then ask you what TYPE of connection to establish with the computer. Choices are DATA STORAGE for transferring files only, or (for my particular mobile) NOKIA MODE to be able to access more capabilities. Select NOKIA MODE, or the equivalent for your mobile. Now go to your Network Manager on the Top Panel and click to see available connections, and you will find a new entry there saying “New GSM Network” (or something similar, what it says there will differ slightly on Karmic and Lucid). The rest of the steps are the same as in my previous post. Thanks this help me out alot. I live in India (Tamil Nadu). 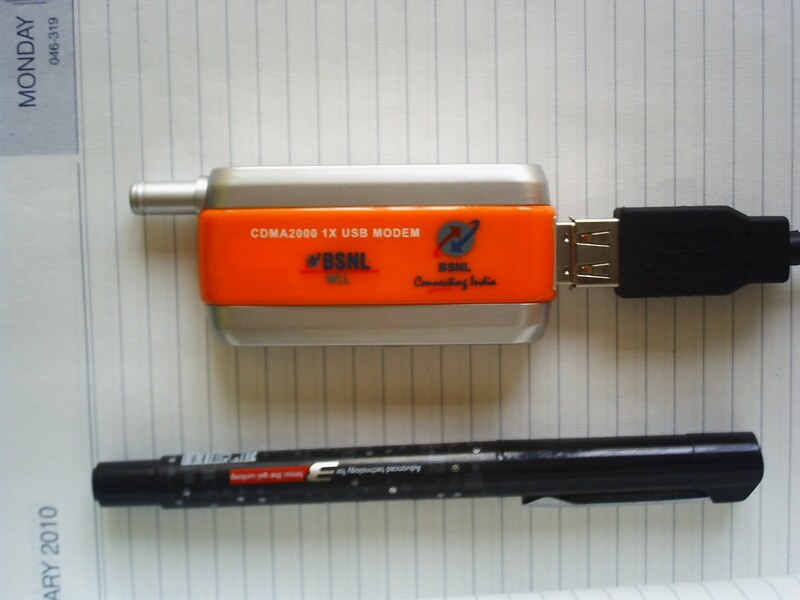 I am using BSNL CDMA 2000 1X Wireless USB Modem. It is like dialup modem. How do I install in Ubuntu? Please guide me. Have you tried plugging the Modem into the computer and checking to see if it is detected? It not give that a try. If the modem is detected you may be able to use Wvdial to connect to the Internet. 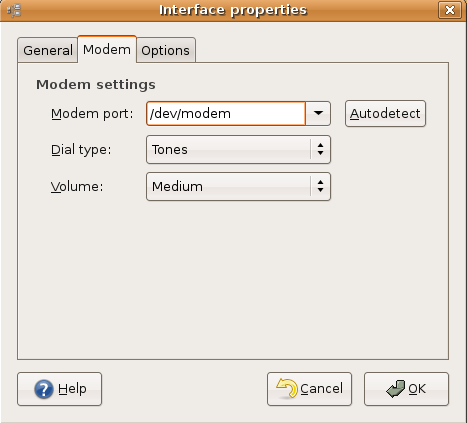 If the modem is not detected it still may be possible to “point’ Ubuntu to the modem by installing the modem’s drivers. See the paragraph below. You will need to make a Folder for the download file. Extract the zip(download) file into the folder you have made. You may not understand what each of the files mean but simply allow them to open in the folder you have made. 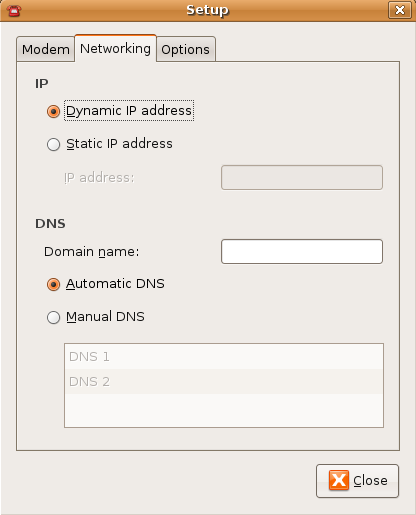 This is important as it makes a location that Ubuntu can point to find drivers to make the modem work. If you have extracted the driver files correctly. The CDMA Driver should be detected. You will be able to press the “Enable” box that will appear in the Hardware Drivers Window. Restart your computer. Insert the Modem then try the Wvdial procedure. I have not tried this method with Ubuntu 8.10 and earlier but it should be a similar process(If your Ubuntu Distro is 8.10 or earlier). You don’t have to create a manual network connection. If you have DSL(Broadband)then simply insert the Ethernet Cable into your computer. Ubuntu detects instantly without having to create anything. Test this past clicking on the Firefox icon and see if the browser connects. If you are trying to connect wirelessly–you still should not have a problem. Verify that your Network card is properly installed. Ubuntu should be able to drive it without incident. 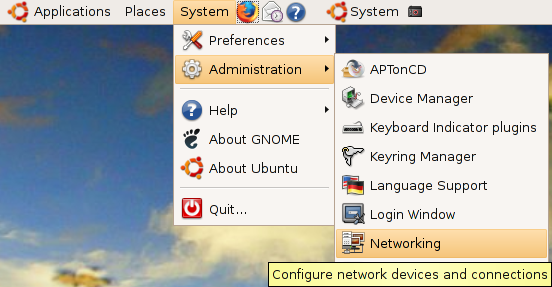 Place your cursor on the Network Manager Icon on the top Right corner of your monitor screen. You should see a Network Connection Window appear. Select whatever Wireless Option shown. Then try the same test..Open Firefox and see if connects. hi! i am using BSNL CDMA CT800P.its like a dialup modem.how do i install in ubuntu..? I am sorry for the delay in replying. I am afraid you asked your question during a very busy time of the Holiday Season. I am not familiar with the modem that you have requested help with but I did do a little research and it may be possible to get things going. Scroll back to the Post I just mentioned. Read it several times. You may need to print it and apply those steps to start your modem working. 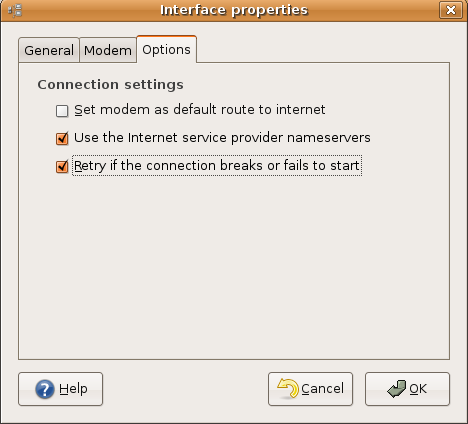 Of course, before doing anything….Connect the modem to the computer and see if Ubuntu detects it. You may not have to do anything more. I don’t know which Version of Ubuntu you are running. If you are using 9.10, 10.4 or Higher. Things might work “right out of the box”. 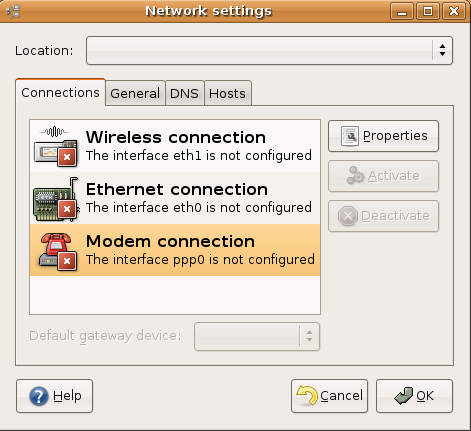 I have been trying to set up a dial up modem , off and on , for three years.I have used three ubuntu systems. I am now using 9.10. I have had the same problem with all three. There is no “networking” , there is networking tools under authorazations and network connections under appearences. None of these allow me to set up the modem and the internet connection. 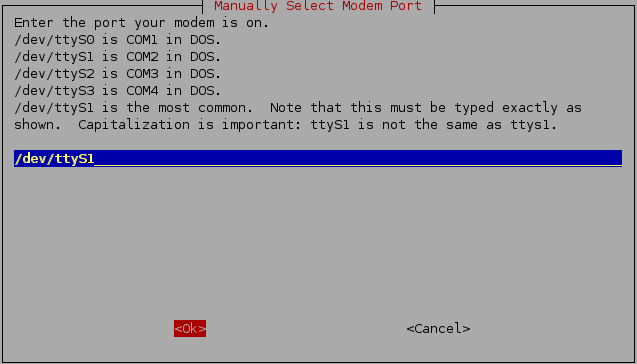 I am using an usr5686e external modem and the system recognizes the modem. What do I do, other than staying with windows. I built a 9.10 Karmic Setup for a person just under a year ago and that person used Dial up too. So this issue is very simple to remedy. You stated that the modem is detected and that gives you the option to use Wvdial. You don’t need to worry with “Networking” or “Permissions”. 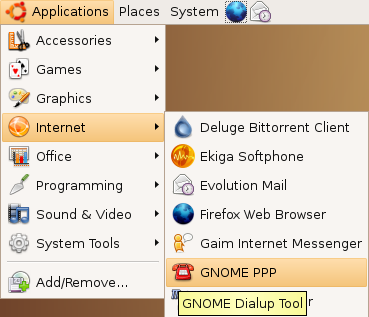 By using Wvdial you will be able to go online then use the ADD/REMOVE Software Center to install Gnome PPP or K-PPP which are almost identical to Windows GUI Dialup Window…I am using the Gnome version at this very moment on the ancient but reliable 8.10 Intrepid Ibex System. This is how to make Wvdial work. #6. Save the Text Document then close. #9. 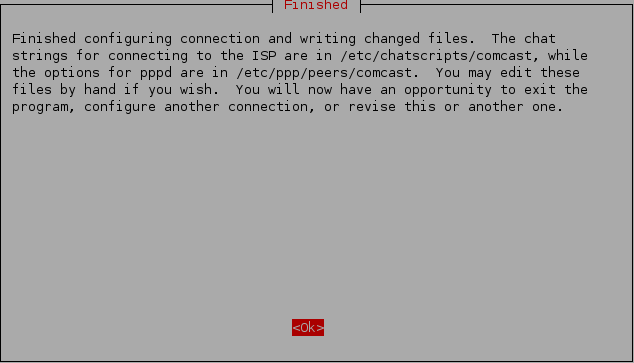 Wvdial will now connect to the modem…dial the number, UserName, PW to ISP you placed in the Text document and connect you to the Internet. From the posts i’ve read it seems to me that most of the guys are using dial up modems. i on the other hand am using a reliance netconnect ZTE usb modem. i still cant seem to get it to work!!! been tearing my hair out for about 36 hrs now!!! and please keep it as simple as possible.. I am very happy to help you. #1. It seems that all you really require are the Specific Command Instructions for Wvdial Conf as they relate to a USB Connection. #2. 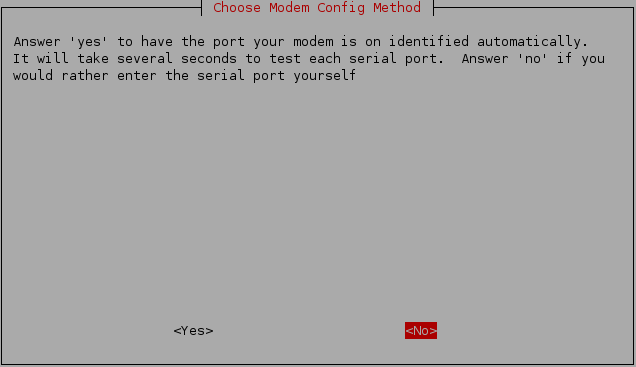 The following directions are based on configuring for your Exact Model Modem but they should work with any USB modem. #3. Let’s edit Wvdial for USB( You can Copy/Paste. I will not include quotation marks ( ” “). Notice the difference in the command line we will use. Usually, I would instruct use “sudo gedit /etc/widial.conf” but the command below is specifically for a USB Modem configuration. Some Tech Help sites advise to Use Both Commands Lines but based on my research–Plus I actually tried it on a Laptop Running 9.04. Using the Command line below should be sufficient. #5. 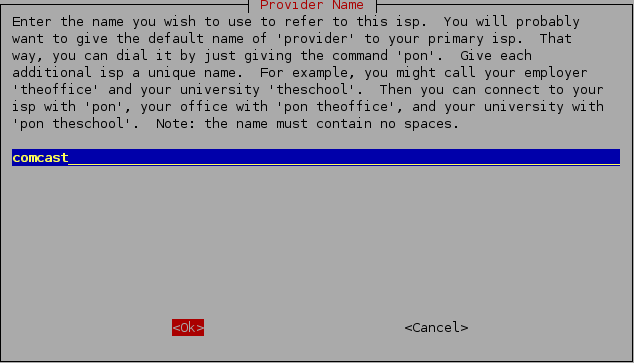 Where Applicable type the Necessary Information–UserName-ISPNumber-PW .. Save then Close the Wvdial Conf Document. #7. If prompted for PW–Type then Press Enter. And your Modem should activate and connect to the Internet. Here are some Reference Links should you need them. when i type sudo vi /etc/wvdial.conf anpther terminal opens up. i enter all the details as above but after that i dont know how to save it. if i try to close it, it warns me saying i’m about to close the terminal. –> Carrier detected. Starting PPP immediately. –> The PPP daemon has died: Authentication error. –> We failed to authenticate ourselves to the peer. –> man pppd explains pppd error codes in more detail. I understand your problem and it’s simple. You made a very Rookie(novice) mistake. You opened TWO–Terminals. Only ONE- Terminal should be open. When you “Edit” information into or delete from a Configuration File–that Edit is done in a Gedit which is a Notepad-like Document also called Text Editor(in older Versions of Ubuntu). #3. Give your PW-Press Enter-Then Wait for approx One Second. A Gedit Document will appear like magic. #5. You must make the following changes in the Information you just pasted into the Gedit–so they fit your Personal Information. LEAVE ALL THE OTHER COPY/PASTE EXACTLY AS IT APPEARS IN THE EXAMPLE. #6. Double Check your work. Then go to the File Menu in Gedit and Select Save. Close the Gedit Document. #7. You should now see the ORIGINAL Terminal you opened at the start of this attempt. The type of mistakes you made are common among people first learning how to use Command Lines and Terminal. It’s not a big deal. 🙂 Don’t worry about it. Jeevak…OOps..I see a slight Omission in the Wvdial Edit Instruction. Copy this Version of #4. #1 if i type just sudo vi /etc/wvdial.conf then a Gedit type of file doesnt open up! 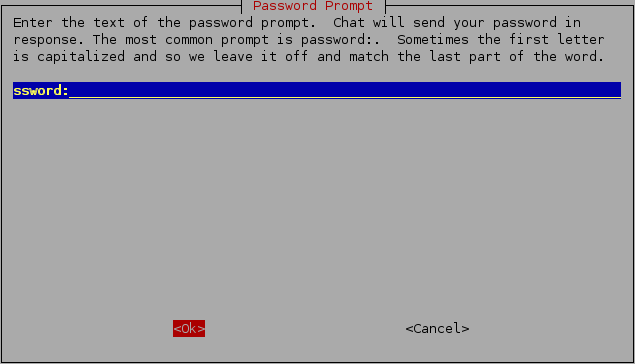 the terminal window in which i typed the above command disappears and another with the settings appears. if i have to make corrections in that, its extremely tedious as i have to constantly press the “insert” key to make any enteries. i wish i could show u a picture of the window that opens up……. also, now, when i type the above command this is what i get and it looks a little scary!! different instances of the same file when making changes. Quit, or continue with caution. to recover the changes (see “:help recovery”). also bit confused about my ISDN number…never ahd to look for it before…where?whom should i ask/look for it? ISDN Number means Integrated Services Digital Network (ISDN) and on this point I am in error…I mistook it for the ISP access number whose Entry appears Higher in the Edit List. I am afraid I misread while researching your problem. You don’t need to worry Inserting a Specific Telephone number where it is concerned. My apologies. I understand what your problem is but I do not understand why you are not seeing a Gedit Document. 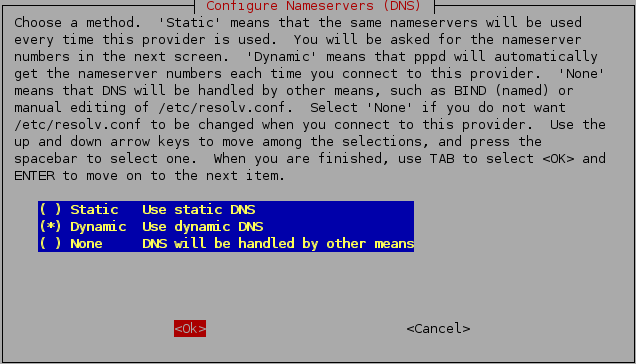 Also, you will never Conf(Configuration) Make Changes in Terminal. You don’t need to use the Insert Key to add/delete Conf Edits. It is simply cut and paste or typing simple things such as User Name and the Password. Let’s try it this way. At this point a Gedit Document should open. If you don’t see it. Try Minimizing the Terminal Window. It could be hidden behind it. I understand your frustration. I have had my share of hassle getting things to work from to time. This is simply a matter of overlooking something. i’m a bit bald to begin with…at the end of this i’m gonna look like yul brenner!!!!! Ok. It looks we are on the right track…When you copied the Edit Info….did you include your Personal Information? If not try again. If that fails. I will research the Error prompts more thoroughly. 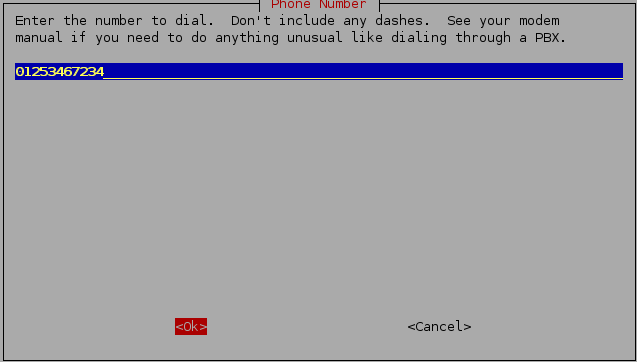 –> Warning: section [Dialer Defaults] does not exist in wvdial.conf.